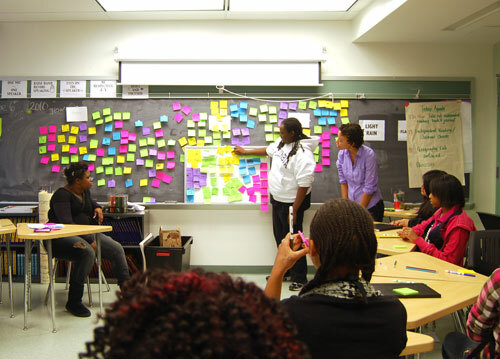 We’re teaching a three-day workshop this week at the Cooper-Hewitt, National Design Museum. We’re excited to lead 25 NYC high school students on an adventure to discover why and how we share our experiences in a digital world. We’ll be investigating technology from the past and present, and dreaming up new ways to use lo-fi solutions and mobile technology to design experiences for the future. Your friends are visiting from out of town and they really want to go to the High Line. Too bad you’re stuck at your summer job and can’t go with them. Create an interactive experience that makes them feel like you’re right there with them. We’re taking a field trip to the High Line tomorrow so the students can better understand the experience of visiting such a place. More to come this week! 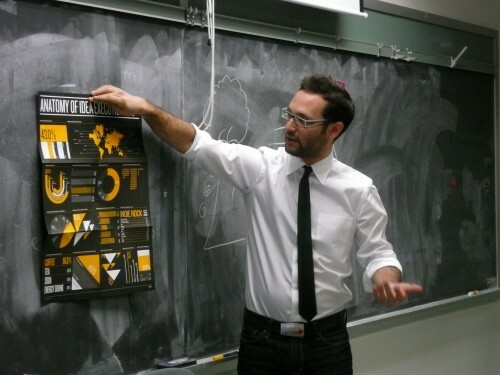 For more, check out the Cooper-Hewitt’s write up and our story over at SVA’s Visual Briefs. 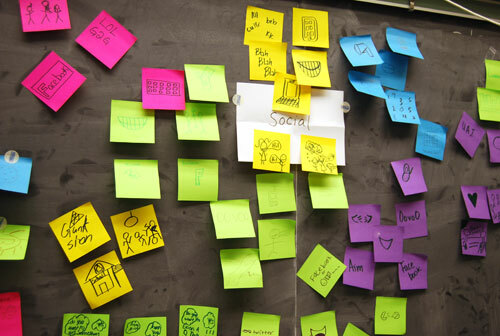 How many ways could you describe “social” or “community” if we only gave you a pen, sticky notes, and 2 minutes? Or what about “happy” or observe”? 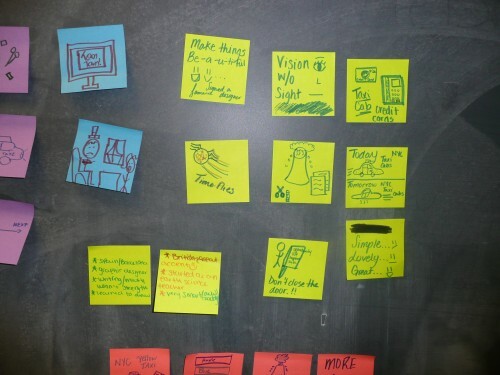 Would you be stumped or run out of sticky notes? 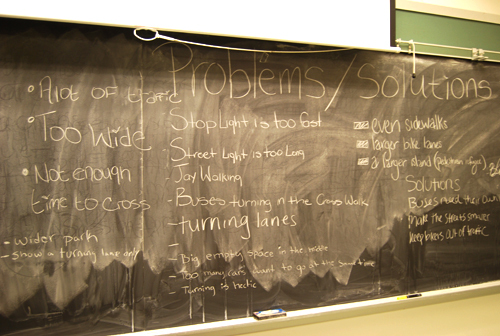 Wednesday’s class was all about brainstorming. Our students are familiar with the concept of brainstorming through class assignments and projects, so Katie and I wanted to give them a unique experience that would get them sketching like crazy and out of their seats. Looking for a fun way to brainstorm, we decided to adapt a game called Graphic Jam, from the book, Gamestorming: A Playbook for Innovators, Rulebreakers, and Changemakers by Dave Gray, Sunni Brown and James Macanufo. The game challenges participants to visualize words that often seem too abstract to imagine in a tangible way. Participants are given two minutes to sketch as many ideas as they can to represent the chosen word. We thought this would be a great assignment for our class for a few reasons. Many of our girls keep saying to us that they’re not any good at drawing, and we are determined to break that mindset and get them comfortable with thinking visually. And, we want them to know that having lots of ideas is critical to finding the right idea. 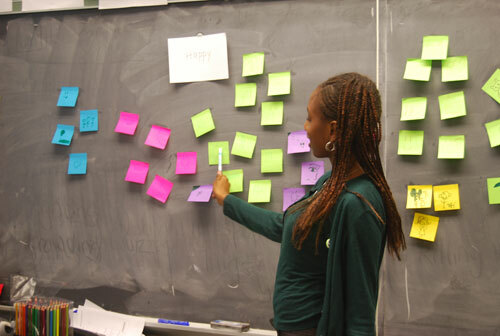 We also wanted them to know that brainstorming can be more alive than just writing words on paper. The Graphic Jam was a huge success! Each word generated tons of tiny sketches. 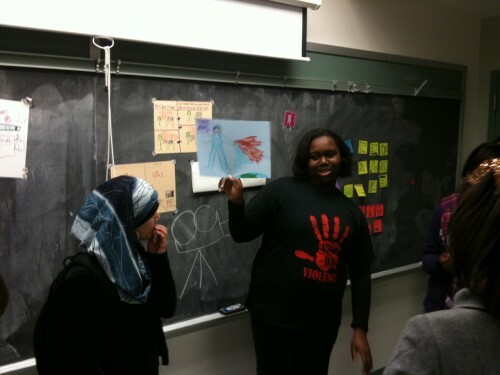 When time was up and the alarm rang, the girls rushed out of their seats to post their sketches to the chalkboard, with over half the group eagerly volunteering to explain their sketches in front of the class. Show Me Your Moleskine Notebook! 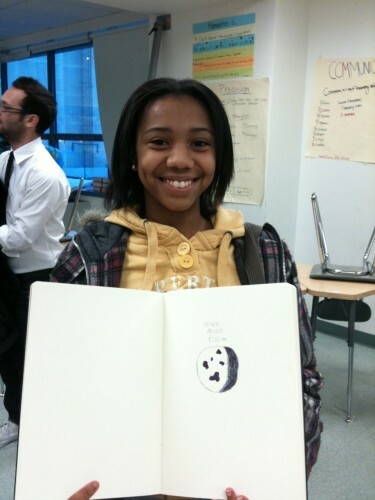 We handed out “Sketchtastic” buttons to a few girls who shared their sketches, poetry and pictures from last week. We’re hoping to see more next week and share a few on the blog. Week 2 Lessons: To Stick or Not to Stick? Standard post-it notes don’t stick well to dusty chalkboards. We need to be more aware of the moment when conversations go from relevant to not. Our students are awesome, but in the end they are still 14 and 15 year old girls. It’s easy for us to get wrapped up in the fun of our activities, but as teachers we need to remember to ask the “hard questions” and challenge students to think more critically about their ideas when they present them. Students are asking us if they can take home some of our materials, and others have requested pencils for sketching. After our class is through we’d like for our students to be able to continue sketching, collecting, and creating on their own, but many of them don’t have access to the materials that we take for granted in our work. We’d love to be able to give them a small grab bag of designer goodies to continue their explorations. There are only 5 days left in our Kickstarter campaign and we’d love to see your support. We need less than $2500 to make our goal! Please support our program with a donation or spread the news to your friends! 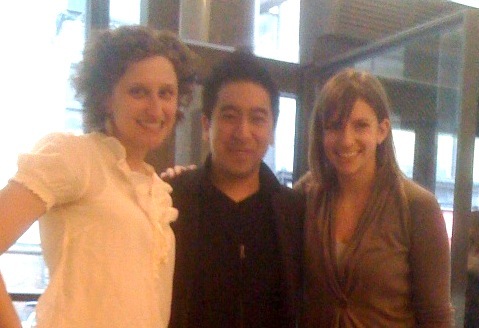 Katie and I attended Teaching + 30: The Future of Teaching, a Y + 30 Meetup event. The panel discussion included some of the brightest minds in the field of education including David Levin, co-founder of Kipp Schools and Joel Rose, Founder of School of One. All of the panelist were very opinionated about what’s wrong with education today, some saw the system as not broken but just in need of a slight redesign, while several of the panelists talked about the need to bring more respect to the teaching profession. When it came to talking about the future, many of the ideas for change centered around technology. Jose Ferreira, Founder and CEO of Knewton, an adaptive technology learning program, spoke of the need for more data in education – data to assess the progress of students to help identify learning styles and difficulties and to also evaluate the effectiveness and capabilities of teachers. Joel Rose concurred as he talked about the success of School of One and their use of technology to provide lessons based on student performance. Alex Grodd, founder of Better Lesson, a curriculum sharing platform, and a Teach For America Alum, was the biggest advocate for teachers. Grodd talked about the need to give teachers more resources to connect with each other and build their community. However, despite the call for technology to help augment classroom lessons, curriculum planning and student development, all the panelists agreed that no amount of technology could replace the intimacy of teaching. The personal relationships that teachers build with their students through mentoring, tutoring, and one-on-one instruction is truly irreplaceable. So as we go on a path of deciding how teaching will change in the next 10, 20 or 30 years we must remember that the human connection is still very relevant and critical to the teaching and learning experience. 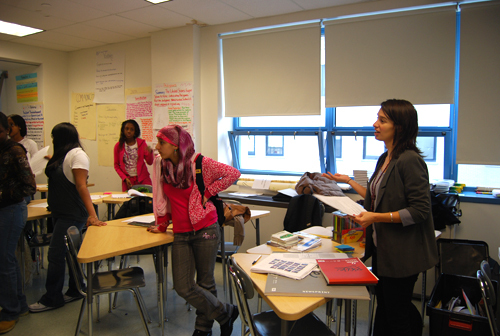 Check out this post over at Design Observer about the new unified global teaching program from Wendy Kopp and Brett Wigdortz. After weeks of research, interviews, and brainstorming, Katie and I have a designed a curriculum that we believe will appeal to both students, school administrators, and faculty. So what’s our next focus? Besides finding a school to partner with, I am exploring beyond the curriculum, and thinking about the experience. On my blog, I recently wrote about iPhone games and Hugh Dubberly and Shelley Evenson’s Experience Cycle. 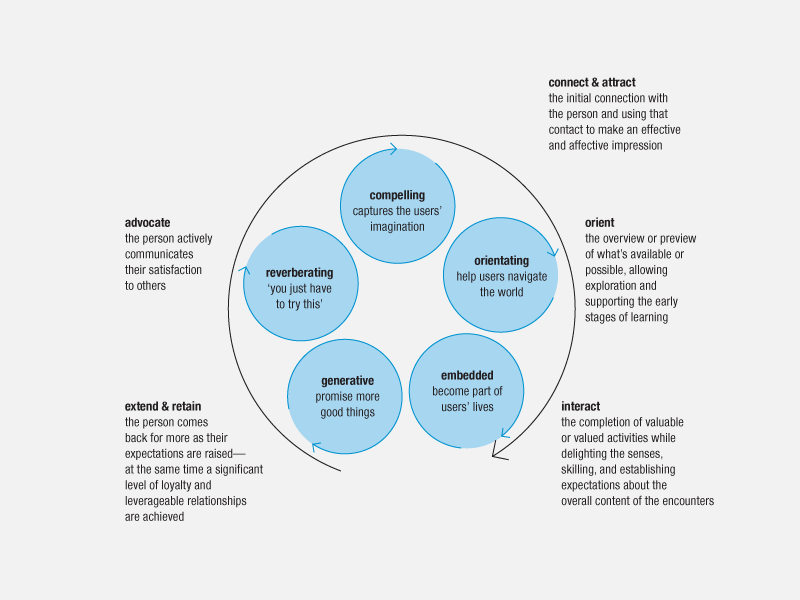 The Experience Cycle is a continuous relationship and conversation between a consumer and a product or service. Instead of focusing on single interactions with consumers, the Experience Cycle, is a holistic approach to consumer engagement – from awareness to advocating. Successful companies, like Nintendo and Zappos, provide case studies in this method. Their success can be attributed to creating relationships with their consumers as well as continuous interaction at every possible touch point. I believe the Experience Cycle provides an interesting framework for designing how Project: Interaction will engage with high school students and ultimately provide guidelines for measuring the success of our program. The Experience Cycle has five steps. 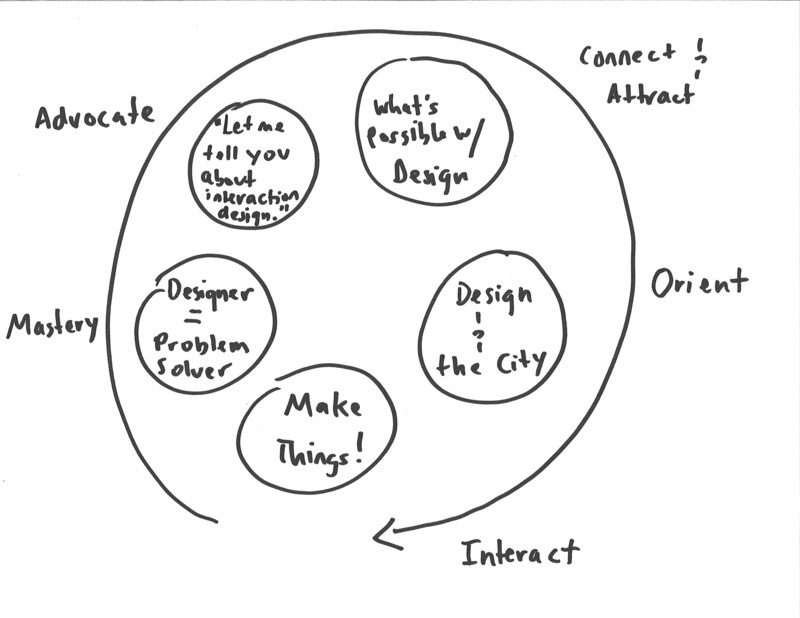 Below, I outline the Project: Interaction experience at each of these points. We’re connecting with students at a community level. The attraction to our program will be that students will learn that they can design products and services that impact the community around them, which could be their school and/or neighborhood. Each week of our curriculum explores one area of interaction design and relates that concept to New York City. 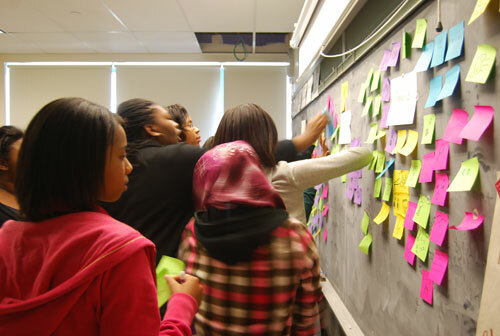 Students immediately began to think as designers, discovering how design influences the environment around them. 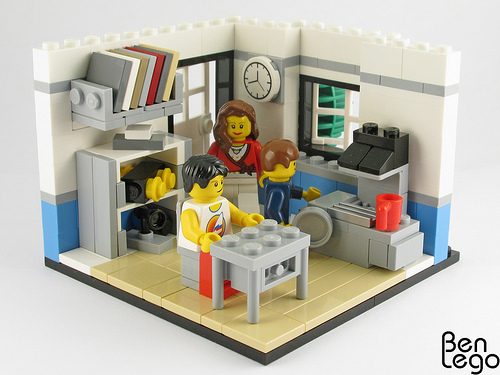 Students will begin exploring problems and solutions that can be achieved through design. 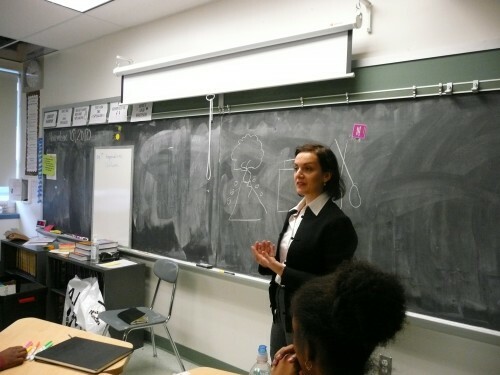 Our program isn’t about lecturing the students each week and having them sit still and take notes. We want them to make things. 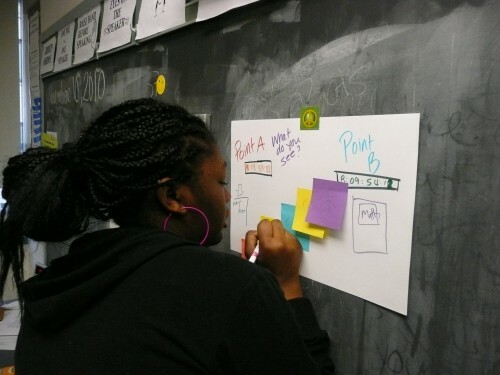 As we explore environments, mobile technology, and services, students will brainstorm, sketch, and design their own solutions to topics we propose. The program is cumulative – allowing students to demonstrate an understanding of the concepts and themes that we teach while becoming passionate observers of the world. After a seven week primer to interaction design, these designers in training will explore a design solution to a problem that matters to them. 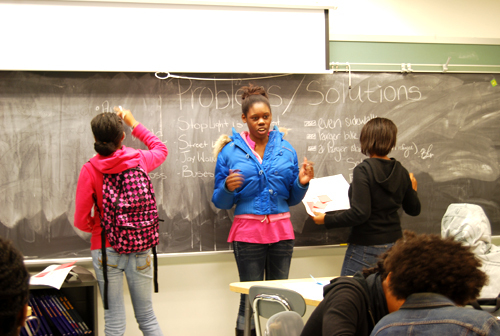 Since Project: Interaction is a new program, our students’ successes (and failures) will determine its success. 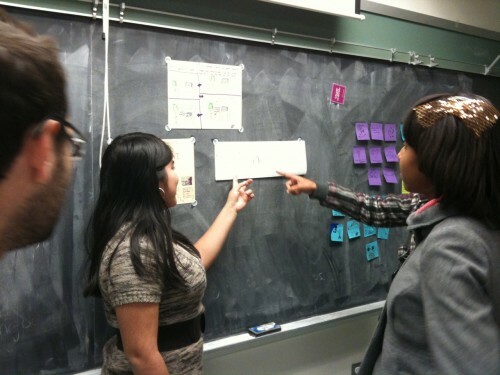 Their exposure to interaction design should excite them about what’s possible with design and intrigue them to learn more. Ultimately as we recruit future attendees, they’ll help us promote our program among their classmates and peers. As we talk with students and schools about Project: Interaction, I predict that we will spend more time talking about the experience of the program than the details of our curriculum. We hope the appeal of both – the tangible and the experiential – will generate interest on both sides and result in a great school partnership. Carmen and I got together last week to lay out our first draft curriculum time line. After taking a few weeks off to finish our other projects, we jumped back in with a huge splash. Everything in our brains for the past four months came flying out and on to paper. Below is our very high level plan for 10 weeks of classes. Goal: To teach kids about design by encouraging them to think of themselves as inventive creators who can alter the world around them by examining it and coming up with creative solutions. Before coming to class: Have the students fill out a survey about their interests and experience. Week 1: What is design? Derek and I had a wonderful afternoon conversation at the City Bakery with Jamie Nestor, a graduate student at the esteemed Teachers College at Columbia University. Overall, Jamie reiterated much of what we’ve heard from education professionals: get kids intrinsically motivated, reach them on an emotional and personal level, and keep it hands on to sustain their attention. Make sure to carefully plan the work and the group assignments, make the goals clear and be transparent about expectations. It was great news for us to hear these concepts reemphasized through Jamie’s inspirational words, and beyond teaching method advice she also spoke about theory and philosophy when handling a class. The second principle is important for creating a community of learning within a school. If every teacher is held accountable it will produce a more dedicated teaching staff that is able to engage students through their enthusiasm and commitment to what is being taught. Jamie asked us what fears we have as we prepare to teach students about design. I spoke first, sharing my fear that the kids won’t love design as much as we do as students and practitioners, and explained how that may be a difficult challenge for us to cope with. Jamie’s advice was clear: when she teaches, Jamie doesn’t expect that her students love the subject matter as much as she does (she used to teach Latin), but she does expect that they leave class with an appreciation and respect for it.